Question about rules in round Robin. My daughter wrestled in a tournament here in Michigan, in Flint. She wrestled on a round robin bracket and the results were close enough that they had to consult the rules for criteria. Classification criteria From the 7th place, wrestlers of each category will be ranked depending on their ranking points, retirement or forfeit, injury or disqualification. In case of a ranking tie, they will be ranked by analyzing the following criteria successively: 1) The most victories by â€œFallâ€ 2) The most matches won by superiority 3) The most technical points scored in all the competition 4) The fewest technical points given in all the competition If the place of the wrestlers cannot be determined with the above mentioned criterion, they will be ranked ex aequo. The wrestlers taking part in the repÃªchage phase will also be ranked according to the ranking points earned during the competition, including qualification matches and repÃªchage. N.B. Disqualified wrestlers for brutality or unfair behavior will be eliminated and not classified. Except with a medical certificate controlled by a FILA Doctor, if a wrestler does not present himself to the mat for whatever reason as soon as the competition has started, his opponent(s) will win the match, and the wrestler will be eliminated and not classified. Ranking criteria for the Nordic tournament a. Only 4 classification points will be allocated for the victory by fall, default, forfeit, or disqualification in the Nordic tournament system. b. In the Nordic tournament, the wrestler with the highest number of victories will be ranked first, regardless of the total number of classification points. c. If two wrestlers have an equal number of classification points, their direct match will determine the winner. The wrestler who wins against his 17 opponent will be ranked before the other one. d. If more than two wrestlers have an equal number of classification points, the last of the ex-equo group will be classified following these criterion until only two wrestlers remain : 1) The fewest victories by â€œFallâ€ 2) The fewest match victories by superiority 3) The fewest technical points scored in the whole competition 4) The most technical points given in the whole competition When only two wrestlers remain, their direct match will determine the winner. My daughter was the only wrestler to have a win by fall. When i went to the table to inquire about how the results went, the father of the boy my daughter pinned walked over and what came next was a half hour debate that did not move his son forward in the placement whatsoever. All he managed to do was ensure my daughter was not given the 1st place, and that it instead went to a boy who was not even there anymore. I just shook my head and gave them the gold medal and took the silver and left. My daughter had already left with her mother so I would have to break the news to her later. In looking back on it though and reading the rules it seems to me that she should of taken 1st as she clearly met the criteria of the wrestler with the most wins by fall. After one person is eliminated from the 3 way tie, the first criteria goes back to head to head. 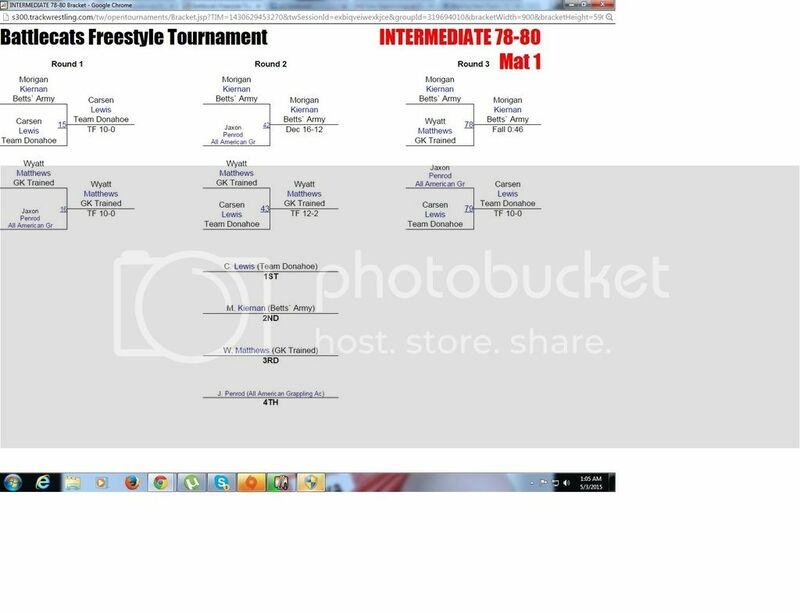 I believe the rules you showed are for placing in brackets below the actual place bouts (placing 10 in a bracket with final bouts for 1-8). Matthews becomes third then Lewis beat Kiernan. Probably not worth a half hour debate. I would say the half hour could have been better spent working on whatever caused her to lose the one match. If you don't win all of your matches you can't complain about not getting 1st. And either way there is probably never a reason to spend 30 minutes discussing what medal your 10 year old should have gotten for winning 2 matches. Just my opinion.